Close your eyes, and imagine a lagoon filled with hot, milky blue water. 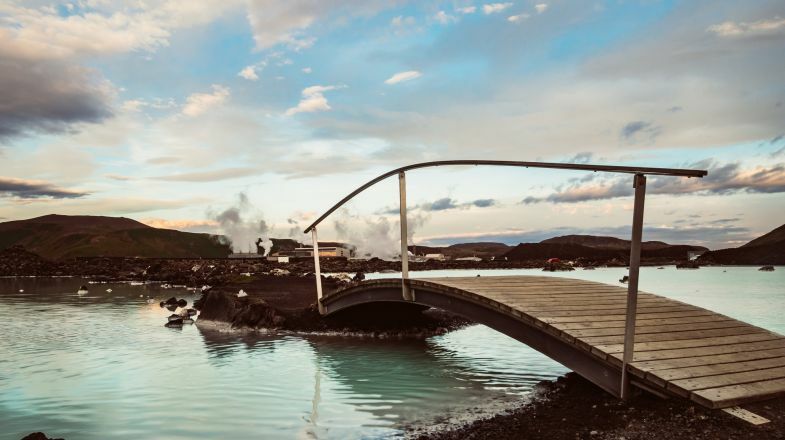 As you stand on the shore, surrounded by the volcanic rock of lava fields, and see the steam rising off the water into a frigid twilight sky you might believe for a moment that you were standing on the surface of an alien world. As cosmic as this landscape might appear, it is actually an apt description of one of the most unique locals of our own amazing planet - the Blue Lagoon in Iceland, the most popular of the best hot springs in Iceland. 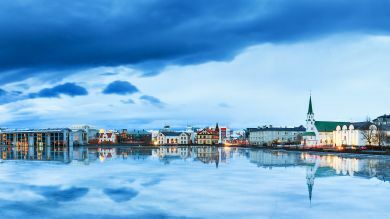 The average temperature in Iceland in the month of July is 10-13 degrees Celsius, and in the winter months that average drops to a chilly 4 degrees Celcius. Add strong and persistent winds, and you have one chilly situation. Be that as it may, the waters of the Blue Lagoon are beyond warm. With temperatures ranging between 37-39 degrees Celsius, once you’re in the water, you’re home free! 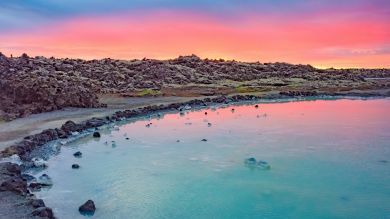 This contrast is part of the beauty of the Blue Lagoon, with hot waters under cold air, the air fills with steam that gives the blue waters surrounded by moonlit lava fields dusted with snow, an almost alien allure. This dichotomy of temperatures has a euphoric effect on the bather that ultimately leaves you feeling refreshed, relaxed, and ready for whatever Iceland offers next. There are four different packages to choose from, and deciding in advance which you prefer will help you prepare for the best possible time. 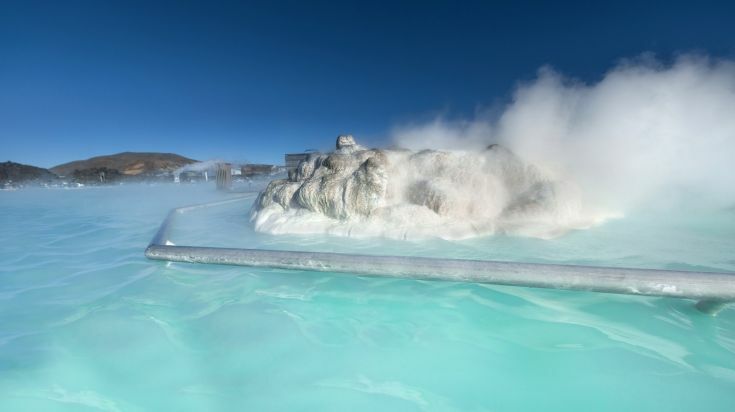 The Standard package covers your access to the Blue Lagoon, and the Silica Mud Mask that you see everyone wearing in their social media selfies for just 5400 ISK (48 Euros). Don’t skip the mask by the way, it deep cleans your pores, strengthens and tightens your skin, and leaves your face feeling “super smooth” for the next two days! It has even been shown to have a beneficial effect on psoriasis. The Comfort Package, at 7400 ISK (66 Euros), adds a towel, your first drink, and the Algae Mask, which is said to enhance the skin’s collagen production. The Premium package for 9500 ISK (85 Euros), adds even more. Luxury Package at 53,000 ISK (470 Euros), gives you total access to the best of the resorts amenities. Entrance to the Exclusive Lounge, with its open rock fire table, comfortable lounge chairs, free soft-drinks and fruit, private entrance to the water, and access to a balcony overlooking the lagoon may be reason enough to consider upgrading to this top tier package. There is a good reason why The Blue Lagoon is one of the most sought after hot springs in Iceland. It is unlike any place you have ever been. Its unique combination of climate and comforts, creating an almost cosmic appeal; mud masks, soothing, steaming water, and a swim-up bar, are just a few of the amazing amenities you will discover at the Blue Lagoon; so take your time, and do not rush this experience, but allow yourself to truly enjoy this amazing adventure. Other highlights available are in-water massages, the sauna cave, the underwater benches, and the friendly Blue Lagoon’s staff members. The people of Iceland in general are notoriously nice, and the staff at the Blue Lagoon is no exception. The level of service that you can expect when you arrive is beyond excellent. That being said, do not feel the need to tip; it is not expected, and is not needed. Prices here tend to be on the higher side, and the cost of exceptional service is included in your bill. One last word of advice…DO NOT lose your towel! There are so many people here on the busier days, and so many towels that look just alike hanging around, that it is extremely easy to forget where you left yours. So put it somewhere that you will easily remember, because once you lose it, there may be no getting it back, and as cold as the air can sometimes be, chances are you’re really going to want that towel! Just a fifteen minute drive from Keflavik International Airport, the Blue Lagoon offers easy access for the international traveler. Whether making the commute by bus, shuttle, taxi, or rental car you can go straight there from the airport without even stopping at your hotel. From the parking lot, you will walk down a lava rock lined path to the welcome center where you can pick up your wrist band, and drop your bags and other belongings in a locker using your wrist band as the key. This wrist band is your pass to all the amenities that the Blue Lagoon has to offer. Depending upon the package that you purchase, this wrist band will open your locker, purchase your drinks, and give you access to the luxury lounge, no wallet required. Forgot to pack your swimsuit? No problem! You can rent one. Need a towel, a robe, or some slippers? Those are available too! Of course, these amenities come at a price, so if you want to save a little to spend later, be sure to bring your own things. Be sure to book your tickets in advance, because if you don’t, you may not get in when you are hoping to. Spontaneity may be one of the spices of life, but if you don’t plan ahead you may wind up with a bad taste in your mouth. 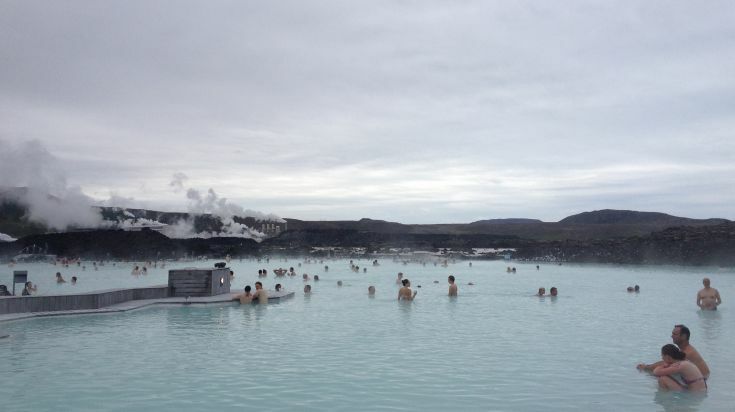 With so many visitors coming to the Blue Lagoon each day there is no guarantee that you will get in if you plan to purchase your ticket when you show up. Booking your reservation in advance will help ensure that your day unfolds as planned. If this description of the Blue Lagoon has made you want to book your ticket today, rest assured that these short paragraphs cannot do justice to reality that awaits you at The Blue Lagoon. Don’t let the frigid air cool your enthusiasm, but embrace the experience, and get ready to dive into one of the most unique adventures you could ever have; those soothing warm waters are waiting for you!